Kérastase introduces INITIALISTE, a revolutionary hair care product that works on your hair to make it healthier, stronger and more beautiful every day. 1. Mallus Domestica, native plant cells taken from a millenary known apple species are known for their ability to fight against ageing in human tissues and to optimize the environment of stem cells, thus maintaining their regenerating power. 2. Aqueous green tea leaf extract: Enriched with polyphenols to protect the stem cells’ environment from pollution, UV rays and oxidative stress. 3. Glucolipids (SP94) that acts on the external hair sheath, where the two stem cells’ reservoirs are. The lipid component consolidates the structure of the follicle’s external sheath. The “Gluco” component is an energy reserve that enhances the cell metabolism and enables the growth of healthy hair. The hair becomes stronger and more resistant to breakage. 4. Ceramides imitate the natural hair components, and strengthen the resistance and cohesion of the capillary fibre. Improves hair quality and texture. 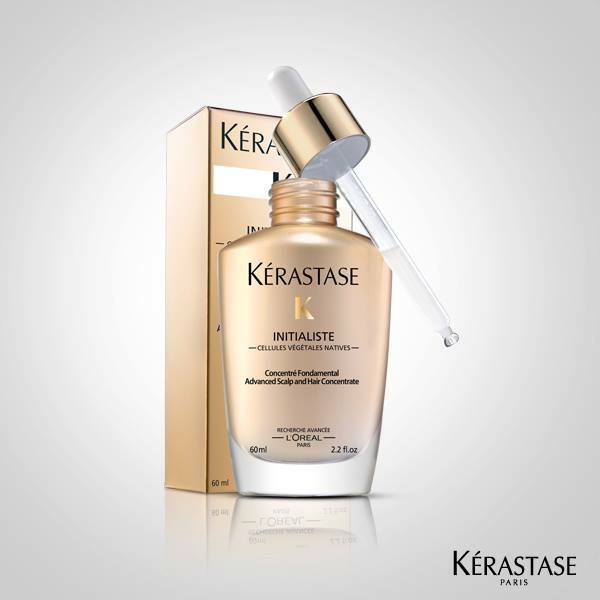 With INITIALISTE Fundamental Concentrate, Kérastase has created a new universal beauty Ritual for both in-salon use and at home, to keep hair beautiful for a long time. Step 1- Bathe - Use a shampoo that suits your hair type. Step 2 - Treat - Wash off the shampoo and apply a conditioner/masque to lock in the natural oils of the scalp. The new 3rd Step- 'Regenerate' - The INITIALISTE serum completes the process by adding a new step i.e. "Regenerate" to the regime, for stimulating the growth of radiant healthy hair. INITIALISTE is a leave-in product that is applied on towel-dried hair, directly on the scalp, just before styling. Take one to two pipettes, depending upon the thickness of the hair and gently massage with finger tips to spread the product evenly across the scalp. to get lustrous beautiful hair. I so wanna try this!! Seems to be interesting...would love to give it a try!